Are you looking where to go on holiday in September? Looking for a hot holiday destination in September? We have had a look at some of our most popular locations for staying on a boat in Europe and found a selection of places to go that’s hot in September. Often regarded as one of the best times of year to visit, the mediterranean sees more consistent air temperatures and the sea perfectly comfortable enough to swim in. Staying on a boat in the sunshine will offer you a great September holiday experience. Here we have highlighted the best places to stay with the added benefit of the unique accommodation on a boat. Choosing a short break in September is one of our top tips from our post on discovering how you can cut costs and travel smarter on your next holiday. In this post we highlighted our Beds on Board travel tips and holiday secrets … including how staying on a boat instead of a hotel can save you money on your next getaway! September will be less expensive and less busy. You will often find the queues have disappeared, the beaches are less crowded and it is far easier to get a table at the popular local restaurant. If you want beach holidays in September, there are plenty of destinations in the Mediterranean where you can find perfect places to stay. Staying on a boat will not only give you a unique accommodation experience but most marinas are located in amazing locations and often in close proximity to some of the best beaches. September in the UK has a proved over recent years to give late summer sunshine and steady temperatures providing a great opportunity to take a short break. Stay on a boat in fantastic locations with easy access to historic and geographical landmarks, discover local food and drink or simply relax amidst picturesque scenery. September is also a good month for city breaks. Once the crowds have started to disperse, European cities offer an eclectic combination of history, culture and architecture as well as some incredible local cuisine. Beds on Board has a great selection of boats in city locations, perfect for short break ideas. Likely to be a top September sun destination with temperatures around 27°c, Malta is one of the best places to visit. A location in the centre of the Mediterranean that is very easy to fly to, Malta offers a stunning coastline, history and culture in abundance and plenty of intimate beaches. Discover more about Malta and how you can “holiday as the mood takes you” in our earlier post and find out how to indulge in outdoor living at its best. Another firm favourite from our searched locations and the subject of an earlier post highlighting why we think it is such a unique holiday experience. It’s little surprise that Greece and its islands are popular, with temperatures remaining mid 20’s throughout September. Often accompanied by great flight deals at this time of year, Greece offers an abundance of choice in style and size of location. When you book a holiday on a boat in Greece, you’ll have a first–class base to enjoy a destination of great beauty, charm and traditions. Marinas located close to beautiful beaches, countryside scenery and a relaxed way of life that’s typical of this part of the world. Combine this with great restaurants and boutique eateries, history and architecture in abundance, it is little wonder this will always be a good choice of holiday destination with a large variety of boats to sleep on. If sunshine is simply all you are looking for then Turkey is the perfect place to go that’s hot in September. The temperature is likely to remain above 30 degrees and with its popularity as a late sun destination there is very easy access to flights. The biggest holiday destinations, where there are plenty of boats to rent, are along the Mediterranean coast from Bodrum down to Antalya and down to Dalaman. The summers are often known to linger well into September and sometimes into October in the France. In the South of France the temperatures often hover around a balmy 25°c so there is definitely an opportunity to take advantage of the wide long beaches with accompanying promenades. Choose a different kind of short break and search for our boats to stay on in France. Discover marinas surrounded by shops and traditional eateries. Enjoy that special French feeling of wandering to the local patisserie for a pain au chocolat and follow the aroma of piping hot rich coffee. With around 600 miles of coastline on the Atlantic coast there are beaches galore to choose from and it’s still beach weather in September with an average of 27°c. The best known holiday destination is The Algarve, the region on the south coast of Portugal, however there are marinas along the west coast becoming very popular for staying in Lisbon and Porto. Wherever you choose for your holiday on a boat in Portugal you’ll find fresh sardines on every local menu and with a nice glass of local chilled Rose wine in the shade you can just imagine yourself on your boat relaxing by the sea. If you are looking for places that are hot in September or simply to stay on a boat in interesting locations we are sure that Beds on Board will have a perfect option. 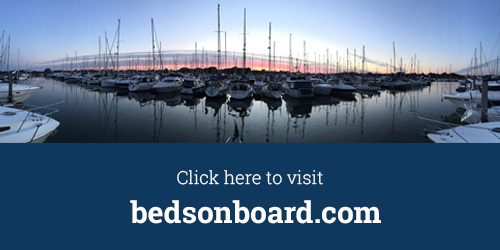 Signup today, visit bedsonboard.com and start searching for a unique place to stay in the September sun. Have we missed your favourite destination? Let us know in comments below.